Elizabeth always hosts a 2nd on the 2nd party on the 2nd of the month, where we can show things from previous posts. Always stunning photos, Valerie. The little raven is so cute! I love your Van Gogh page, my friend. And your green-blue face is just amazing! As I have curly hair, there are a lot of times that I wish I could stitch them to stay in place!!! Ha, ha. Hugs, my lovely lady. Your Vincent is magnificent Valerie, I have attempted to paint and sketch him many times but have never been happy with the composition. There are many of my canvases and pages that he is hidden within the page. Your blue/green lady is a beauty and I love her stitched hair both marvellous pieces. Your lavender looks a lot more healthier than mine now as the Bee's and Butterflies have feasted on it for many weeks. I am sop incredibly impressed with the fabulous image of Vincent. SO lifelike. Even he would be impressed, I'm sure. It is a simply marvelous entry to share with us as your second look on the 2nd. I was also impressed with your green lady. Laughed at how you wished you could sew your hair in place. I've had those types of days, too. I am in love with your lavender. Mine has never bloomed and I fear it may never. And those cabbage roses are to die for. Of course, that beetle was a shock as I slowly scrolled past it. Again, thanks for sharing Vincent with us for your second look this month. Talent is in your blood. I never go away disappointed. Art work should be in a gallery as should the photography. Exceptional!! 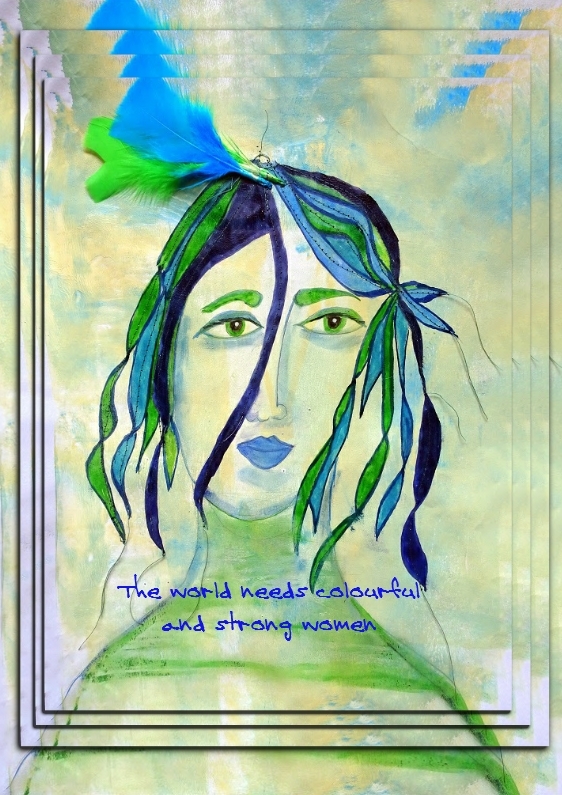 I really like the quote you chose for the blue/green lady... such a powerful image and thought! Love that baby crow too! Great photos and wonderful art! A wonderful painting of Vincent, he looks splendid on the colourful background. I like the idea of stitching your ladies hair in place, adds a lovely details of her. That baby crow is so darn cute. The background to your Van Gogh really makes the face pop. I wish I could stitch more to my (thin) hair. Heh. Deliciously vibrant colors on your art and photographs.I especially love the shade of blue on the bishop's vestments. The baby crow is adorable, too. Hope it's cooled off for you. Humidity is on the rise here for the next couple of days. No complaints from me. Dein Vincent ist total klasse und sieht super aus auf dem orangenen HG. Die grünblaue Powerfrau mag ich auch sehr. Ja wir sollten die Welt bunter, liebevoller und friedfertiger machen und uns unserer Stärke bewußt machen. Wunderschön auch wieder deine Fotos, süß der Babyrabe. I remember your Vincent painting it is awesome. I really love your blue lady and how you used a stitched in feather in her hair. Fabulous selection of photos Valerie, the flower blooms are beautiful. I love your Vincent piece and your blue lady is fabulous, I love the stitching in her hair. Oh WOW! Love your Vincent. Your Van Gogh is lovely as is your blue/green piece. Enjoyed your photos today! Love those faces! And those flowers are gorgeous. ein schönes gemälde und eine hübsche lady,tolle farben auch. A lovely expressive portrait of van Gogh! I love the determined strong lady in your drawing. I just bought a mini sewing machine, my first, and looking forward to trying stitching in art projects. I love your photos too, especially the close up of the lavender. Wonderful pictures, Valerie! The little crow is so cute and those one of the tractor pulling out the hay and that beautiful lavendar :) What gorgeous artwork!! Have a great day! Look at that lavender! Is that from your balcony? Look at all the beautiful flowers. So many varieties and colors. :) Love the baby crow too. Your piece looks great- the colors are so vibrant. I love both your works. Your Vincent is magnificent and so true to the original. Very recognizable. The lady with the blue hair is gorgeous. A good idea to stitch her hair. As always I really enjoyed looking at your photos. Those peonies are lovely. Beautiful photos as always, Valerie. The pink peonies are gorgeous - captured right at their prime. I don't think I've ever seen a baby crow, though crows have flourished everywhere I've lived. I wonder why. Fabulous Van Gogh! You've done others? Have you done "Starry Night?" The blue/green lady looks like a Modigliani or maybe Picasso. I'm delighted to see another side of your awesome talent. Love your Van Gough, and your blue and green faces, and your gorgeous roses! :) Well, I joined in on the 2nd on the 2nd. Hope I did it right! I just love the lavender photo..
Valerie, your artwork...fantastic!!! You are remarkably talented! Love, Love, Love that baby crow!!! Really beautiful artwork Valerie and especially love your blue and green lady who looks very cool with flowers in her hair. Great photos as always too. Have a lovely weekend and hoping for cooler weather for us both. Don't worry, I know that feeling! I love this so much Valerie. Van Gogh is a favorite and I love the hot orange with the yellow and blue and of course I adore your blue/green faces. Both of these are gems. Lovely Van Gogh ~ delightful photography! Lovely details on Van Gogh and some gorgeous photos. Your Van Gogh is charming and I love your blue green haired maiden, she is wonderful! The flower photographs are especially lovely. Hello from Idaho and this is my first time taking part in Paint Party Friday. Oh those beautiful roses. The deer pretty much munch my flowers down to nothing. Hi My Friend! I hope the heat has went away for you! Love both your art pieces! The green face with the stitched feather is really pretty!! Love the baby crow picture! So cute! Wow, fabulous Van Gogh and photos! Oh a beautiful post from the past to now. Great photos. Have a wonderful weekend. I always love your photography and post. I also adore the colors you've used and the eclectic quality of your artwork. BEAUTIFUL! Wonderful! I love the Van Gogh homage! And such great photos, as always! The Van Gogh looks great!! Beautiful brush strokes and colours. Thanks so much for sharing a close up of the face. The girl looks lovely with her blue green hair. A wonderful gallery of photos. Your Vincent has always been one of my favorites Valerie! !